International Women’s Day (a.k.a. IWD) was celebrated by us all and many of us have already liked social media posts or videos across the web. We all know that this day is dedicated to the species from Venus, but how many of us know what exactly IWD is? Why is it celebrated? International Women’s Day is a day when we celebrate the social, cultural, economic and political achievements of women. This day also marks for accelerated ‘gender parity’. It all started back in the year 1908, when a group of 15,000 women marched on New York streets and openly demanded for their rights, better pay and shorter working hours. Since then, every year on 8th March, the entire world joins hands together to support, raise, inspire and motivate women across all fields of work. Every year, there are new challenges to female success, which make it difficult to achieve gender equality in all aspects of their lives. So, people across the globe come together to inspire and celebrate women’s achievements. The entire world rejoices in the extraordinary acts of women by standing together, as a united force to advance gender equality around the world. Past years have focused on various themes such as ‘Woman and Human Rights’ and ‘World Free of Violence Against Women’. Last year, the IWD theme was ‘Pledge for Parity’. It was around asking people all over the world to pledge to help women achieve equality with men. This was to encourage women and girls to achieve their ambitions, face challenges and sustain against all odds and create inclusive flexible cultures. The gender ratio at birth has increased to 919 per 1000 men compared to 914 per 1000 men NFHS 3. The number of mothers receiving full antenatal care has rose to 21% which was 11.6% in the last decade. The color of the theme is Purple that symbolizes dignity and justice which are the two important goals of IWD aim to achieve for all women in all parts of the world. Babycell understands that, the current conventional thoughts of the society towards women need to be changed and hence came up with #KillTheStereotype campaign in a humorous way. Here, we encouraged couples to talk about women killing the orthodox patriarchy, existing social beliefs and doing something extraordinary in various aspects of their lives. We also asked the husbands to share, in what way are they supporting their wives to kill these social-conventional opinions. Being in 21st century, it is high time that the women stop bearing all the social barriers and stand tall against all odds. For this, we all should take a step forward to #KillTheStereotype. This campaign is a tribute to all women across the globe for their great courage for proving that they are equal or better than the men. Baby Milestones – first 3 months of the baby! Parenting is an art and one can never stop learning. The days and nights are upside down. There will suddenly be a lot of changes in your life and above all the tiny one’s alien yelling language that you don’t understand. Yes, that’s when you know that your little one has arrived! After 9 months being a roller-coaster ride for you emotional and physically, your baby finally comes home! Are you ready for this rollercoaster ride? Maybe, maybe not. The first three months of your little munchkin’s life is all about eating, sleeping, pooping and a lot of crying (which you will take time to adjust to). During this period of time, your baby will be trying to understand your actions and may respond by making silly sounds which is one of the many firsts you will experience! If you are one of the lucky mothers, the bonus reaction of your little one is a smile to you which surely will make your day! After making your womb his/her home for 9 months, your newborn is going to be curled up in one position. It’s fine if your baby has a curved spine in the beginning, its bones are all soft for now. This is perfectly normal. In no time you will see your little one stretching his/her body. Your baby’s vision is not completely developed when he/she is born. All new parents need to get ready during the 3rd week of parenthood, as your baby will be able to recognize your face. At this time your baby can see at a distance of 8-12 inches. Blinking is caused due to dry eyes, babies often do not blink much due to their eyes remains shut for a longer time as they sleep more during their initial days. Also, the baby’s vision takes time to develop. Their first view of the world is indistinct and only in shades of gray. By the 6th week, the baby might surprise you with an adorable smile! For an initial few weeks your baby has no idea about the existence of hands attached to its body. The sooner your little munchkin realizes it, he is going to be fascinated when they accidently come into view. It is a cute sight to see your little one getting excited while playing with his/her own hand. You can try to examine your baby by giving him/her a rattle and see if he/she grips it. After a good 10 weeks, your baby starts to find a comfort from sucking on its thumb or fingers. There is no problem in that, but you should make sure not to make it a habit for your little sweetheart. Over a period of time, your little one will gain several kilograms and will be sleeping for a good 3 to 5 hours in the day as well. Although, he/she may still wake you up at midnight when he/she is hungry. This will usually occur in the third month. Most of the babies seem to lose the ability to roll onto their sides independently within the first month. Usually, babies start turning after the 3rd month. All said and done, the first three months of parenthood are very challenging, no matter how much help you have or how prepared you think you are. But again, it is the most beautiful and special time in your life. Folate and folic acid are forms of a water-soluble B vitamin. Folate occurs naturally in food, and folic acid is the synthetic form of this vitamin. Foods that are naturally high in folate include leafy vegetables (such as spinach, broccoli, and lettuce), okra, asparagus, fruits (such as bananas, melons, and lemons) beans, yeast, mushrooms, meat (such as beef liver and kidney), orange juice, and tomato juice. Folic acid is used for preventing and treating low blood levels of folate (folate deficiency), as well as its complications, including “tired blood” (anemia) and the inability of the bowel to absorb nutrients properly. Folic acid is also used for other conditions commonly associated with folate deficiency, including ulcerative colitis, liver disease, alcoholism, and kidney dialysis. Folic acid is used for memory loss, Alzheimer’s disease, age-related hearing loss, preventing the eye disease age-related macular degeneration (AMD), reducing signs of aging, weak bones (osteoporosis), jumpy legs (restless leg syndrome), sleep problems, depression, nerve pain, muscle pain, AIDS, a skin disease called vitiligo, and an inherited disease called Fragile-X syndrome. It is also used for reducing harmful side effects of treatment with the medications lometrexol and methotrexate. Some doctors recommend to apply folic aciddirectly to the gum for treating gum infections. If you’re pregnant or might become pregnant, it’s critically important to get enough folic acid, the synthetic form of vitamin B9, also known as folate. Women who are pregnant or might become pregnant must take folic acid to prevent miscarriage and “neural tube defects,” birth defects such as spina bifida that occur when the fetus’s spine and back do not close during development. How much folic acid you need? To reduce your baby’s risk of developing a neural tube defect, experts recommend that you take 400 micrograms (mcg) of folic acid a day, beginning at least a month before you start trying to get pregnant. 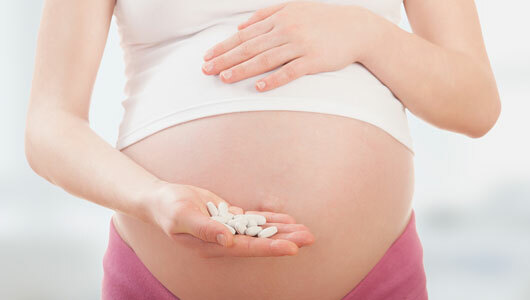 Don’t take more than 1,000 mcg per day of folic acid unless your healthcare provider advises you to. This is particularly important if you are a vegetarian. Vegans are at risk of being deficient in vitamin B12 and taking too much folic acid would make it hard to diagnose that deficiency. The signs of folic acid deficiency can be subtle. You may have diarrhea, anemia, loss of appetite, and weight loss, as well as weakness, a sore tongue, headaches, heart palpitations, and irritability. If you’re only mildly deficient, you may not notice any symptoms at all, but you won’t be getting the optimal amount for your baby’s early embryonic development. After passing through the first and second trimester stages, you would now like to know what to expect in the third trimester. You might feel that your belly can’t get any bigger but it will get bigger all through your third trimester. So, here is all that you need to know about your third trimester. The third trimester of your pregnancy is from week 28 to week 40, which is usually 7-9 months. The feelings during this trimester tends to vary from nervousness to excitement about the baby coming. Here is a week by week guide to your third trimester pregnancy. By this week, your baby weighs nearly over 1 kilogram. At about this time, your baby can open his/ her eyes and turn his head. His fat layers are forming and his new shiny fingernails appear. At this stage, you will be nervous and excited about the baby. Start selecting possible baby names and begin planning the baby’s arrival! Your baby’s head is getting bigger, and brain growth is very rapid at this time. Nearly all babies react to sound by the 30th week. During this time, your baby needs the maximum amount of nutrients and so you need to eat a large amount of protein, Vitamin C and calcium. In this week, the baby’s skeleton hardens even more and the brain, muscles, and lungs continue to mature. While your baby may soon slow up growing, but only in length. He/she will continue to gain weight until he or she is born. In this week, your baby continues to open and shut his eyes. As you and the baby continue to grow, don’t be worried if you feel breathless. This is because, as the baby is growing your uterus is pressing against your diaphragm. You may notice lesser moments of your baby in your tummy. The baby is growing and does not have enough space to move. You’ve probably gained about 2 kilograms this month. Gaining weight is normal during this time. Your little one’s lungs won’t be fully developed until just before birth. The baby when awake will be practising all necessary skills like breathing, kicking and sucking. Some babies have a crown of hair already, others have only a few wisps. In this week, your body begins to start prepping for delivery by flexing its muscles. If you feel your uterus bunching or hardening periodically, those are Braxton Hicks contractions. These are like a pre-labor rehearsal before the real moment. Your baby should already be getting ready for delivery by turning upside-down i.e. his head should be pointing down for a normal delivery. Your doctor will be paying careful attention to your baby’s position in the coming weeks. Keep visiting your doctor regularly. Your baby is getting rounder as she/he will need the fat layers later to regulate the body temperature. If you don’t already talk to your baby, this is a good time to start. If you’ve been nervous about going into premature labour, you’ll be happy to know that most babies born at week 34- 35 and can survive outside the womb. By this week the wall of your uterus and your abdomen stretch thinner and let in more light for your baby. Also, your baby will begin to develop daily activity cycles. This week, your little one is now sporting fingernails and has a fully developed pair of kidneys. You may begin to feel an increased pressure in your lower abdomen and notice that your baby is gradually dropping. This is called lightening or engagement, and your lungs and stomach will finally get a chance to stretch out a little. By this week, many babies now have a full head of hair, with locks around one inch long. But don’t be surprised if his or her hair isn’t the same colour as yours. Babies at week 38 weigh about 3 Kgs and continue to build the fat stores that will help regulate body temperature after birth. Your little one’s organ systems are fully developed and in place, but the lungs will be last to reach maturity. Your baby has reached full term this week and is waiting to greet the world! If your water breaks, call your healthcare provider immediately. With your trimester going on, you would be gaining weight. Sometimes while eating you may even feel full as your uterus is pressing your stomach. Here are some of the interesting cravings pregnant women have during their pregnancy. As long as you’re not at risk for delivering a preterm baby, exercise is safe in the third trimester. But if you’re used to doing exercise, discuss with your doctor whether you should continue your routine. Feeling uncomfortable and going to the bathroom a lot at night can leave you tired. Use a body pillow when sleeping and limit your liquid and food intake after 6 p.m. To combat fatigue during the day, take a five-minute break every hour. Sit back, relax, do deep-breathing exercises or take a walk to rejuvenate yourself. Hope this helps you through the final leg of your pregnancy!